Following the stunning, explosive new footage from Pacific Rim that was shown at WonderCon earlier this year, the hype continues with this cool new banner. 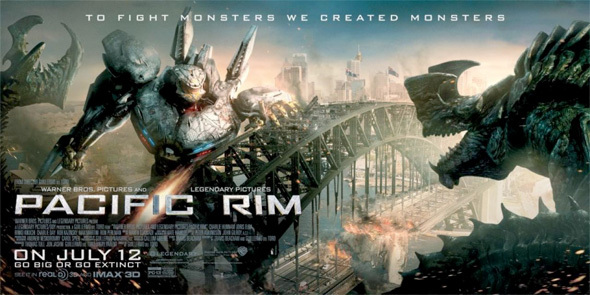 It's the Sydney Harbour Bridge at the center of destruction this time as a Kaiju has torn a huge chunk out of the structure while a Jaeger robot is poised to attack (though it might also be doing more harm than good to that bridge). The scale of this movie is just epic, and while the action does feel like Godzilla versus Transformers, audiences should know that there is a great human element to the script, so we're not just looking at another junky Battleship here. Poster below! Agreed. Although...a mash up of the avengers and star wars would be second in line to that. Exactly, just in general, this movie is going to make a killing abroad. This feels like one of the most intentionally diverse blockbusters ever. The top 3 leads are white, black, and asian. In terms of nationality, they are American, English, and Japanese. There are smaller supporting roles played be Mexicans, Russians, and Chinese(and I believe Aussies). Beyond that, the super-team of giant robots represent that USA, China, Russia, Japan, and Australia. It also features international locales including San Francisco as well as Hong Kong, which is a main location for the film. I mean, we've seen time and time again that big blockbuster spectacle has more or less universal appeal...but this movie has extra elements that could definitely help it pull in more diverse crowds all over the world. I guess I should have said 'Asian'...Not very knowledgeable when trying to sound Politically Correct. Australia is such an awesome place. But they had it coming.